Mr. Yasar Shah inspected and gave formal clearance for the despatch of the coaches in the august presence of Mr. Alok Ranjan, Chief Advisor to Hon’ble Chief Minister of UP, Mr. Rahul Bhatnagar, Chief Secretary, Govt. of UP, Mr. Kumar Keshav, Managing Director, Lucknow Metro Rail Corporation (LMRC), Mr. Alexandre Domingues, Vice President, Operations), Asia Pacific, Alstom, Mr. Bharat Salhotra, Managing a Director, Alstom Transport India, Mr. Ravindra Sannareddy, Founder Managing Director, Sri City, a team of senior officials of UP governmrnt and LMRC, and several other dignitaries. formally handed over the keys. Addressing the gathering Mr. Yasar Shah appreciated the works of Alstom and thanked the whole team of Alstom and LMRC for giving metro train service to Lucknow city. Mr. Ravindra Sannareddy extended a warm welcome to the Hon’ble cabinet minister and the senior bureaucrats of UP government and the officials of LMRC. 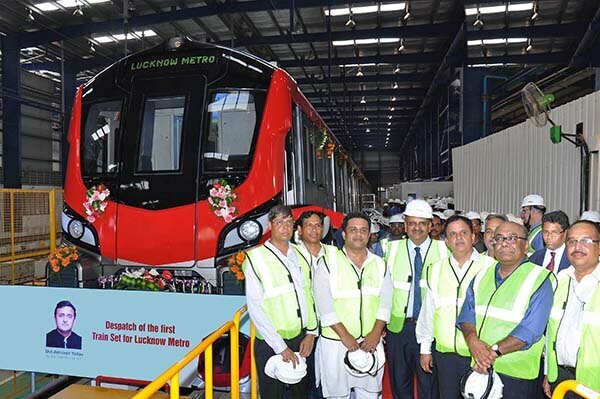 In September 2015, Alstom has been awarded a contract worth over €150 million by LMRC to provide metro trainsets and a signalling solution for the new metro network of the city of Lucknow. Under this contract Alstom will supply 20 Metropolis trainsets, each composed of four metro cars. Each car will be fitted with air conditioning and a passenger information system for a high level of passenger comfort. Alstom will also provide Urbalis, its Communication Based Train Control (CBTC) solution which controls the movement of the trains, enabling them to run at higher frequencies and speeds in total safety. A promoter of sustainable mobility, Alstom Transport develops and markets the most complete range of systems, equipment and services in the railway sector. Alstom Transport manages entire transport systems, including trains, signalling, maintenance and modernisation, infrastructure and offers integrated solutions. Alstom Transport had sales of €6.2 billion and booked €10 billion of orders in the fiscal year 2014/15. Alstom Transport is present in over 60 countries and employs around 28,000 people. Alstom’s Metropolis is a world leading, proven, safe and reliable train that has been sold in over 20 cities around the world, including Singapore, Sao Paulo, Shanghai, Amsterdam and Paris. More than 4,500 Metropolis cars have been sold worldwide since 1998.